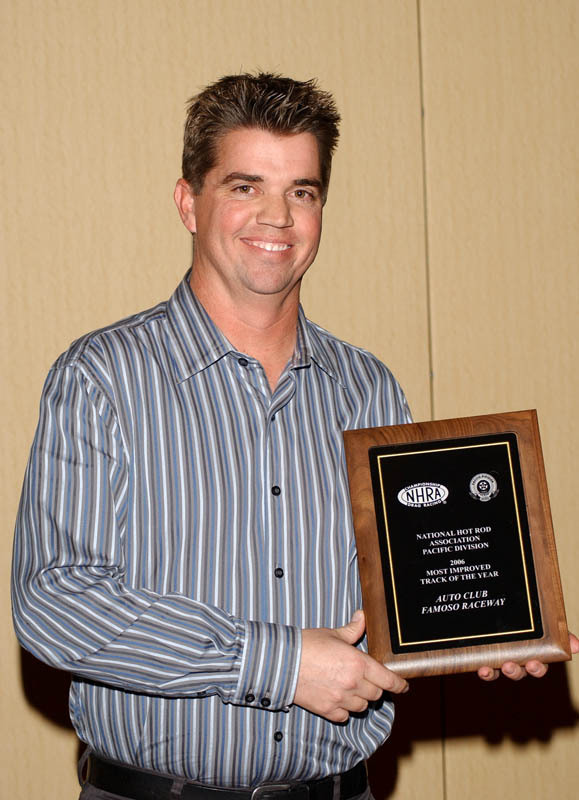 BAKERSFIELD, Calif. (Feb. 28, 2007) � John and Blake Bowser, the father and son tag team who run the Kern County Racing Association, are also the operators of historic Auto Club Famoso Raceway and now producers one of the most famous drag race events of all-time, the March Meet, Mar. 9-11. For John, 64, and Blake 39, Famoso, the March Meet and drag racing have played a major part of their lives. John moved to Bakersfield back in 1952, and Blake is Bakersfield born and bred. John first went to Famoso in the fifties, and actually took Blake's future mom there on a first date. Blake was practically raised at Famoso. Each has worked at various levels of the track, from selling programs, tickets, sweeping up, to running it and promoting events. Together they have seen how Famoso and drag racing � especially the fabled March Meet � have helped put Bakersfield on the map. In this interview, the Bowsers reflect on the rich history of Famoso, the March Meet and what they have meant to Bakersfield. 1. What was Bakersfield and drag racing like in the 1950s? John Bowser: I moved to Bakersfield from Camden, N.J., in 1952, just a few months before the big 7.5 earthquake which wiped out most of the town. My mother owned a grocery store which was destroyed by the quake. That was a nice 'welcome to California' thing for us. When we got here, I thought the West was made up of cowboys and Indians. I got into drag racing when I was going to Bakersfield High School in 1958-59. Bakersfield was a big motorhead city back then and still is. We used to go to Southern California to see drag racing at Irwindale, Lions and San Fernando. They were 'lunch money' trips � we'd save up our lunch money from school, pool it together and go racing. I first went to Famoso in 1959. There was some drag racing at Gardner Field and Taft before Famoso was built, but Famoso changed everything. Back in the fifties, Bakersfield was like American Graffiti—lots of cars and kids hanging out. Racing was fun: you'd Drive your race car to the event, race it and drive it home. 2. How did the March Meet impact Bakersfield? John: Everything changed in 1959 after the first March Meet. The whole image of drag racing changed. There were so many people at Famoso for it. There were people and cars for days. The whole town was excited. People were hanging out at hamburger stands—just like American Graffiti, one giant car show. Everyone drove up and down Chester Ave. The big draw for the first March Meet was "Big Daddy" Don Garlits. People could not believe Garlits was coming here. The Smokers (car club) brought him out. Nobody believed the times he was running back east. It was an East Coast vs. West Coast rivalry. Ed Iskendarian held the prize money. Everyone trusted Isky because everyone bought parts from him. Blake Bowser: Every year, everyone knew the March Meet was coming to town. We'd cut school to go to it. It was a Senior Ditch Day. The March Meet is the single largest event in Bakersfield. It helped put Bakersfield on the map. Bakersfield is Buck Owens, Merle Haggard and the March Meet. 3. How did you both get involved in drag racing and how did it lead you to run Auto Club Famoso and produce the March Meet? John: All through high school I always helped race track promoters, including Famoso. I sold programs, worked the front gate—I was always there. We kept the gates open 24 hours a day at Famoso. That's how I learned the business. I worked with the racers, the fans and the promoters. I learned all their needs. Ernie Hashim was one of the first track operators of Famoso. He was in the Smokers Club. Then Marvin and Barbra Miller took over and ran Famoso. At one time the NHRA operated the track. Jack Williams, the NHRA's first world champion, took over Famoso in 1995. My brother Bobby was very close to Jack. They were like brothers. Bobby even married Jack's sister Arlene. Bobby and Jack worked together at several tracks, including Fremont, and some on the East Coast. Unfortunately my brother Bobby passed away 15 years ago. We worked closely with Jack for years at Famoso, right up to his untimely death last year. Jack wanted us to get more involved in Famoso. We were always a phone call away from him. Jack willed us the lease to Famoso. It was approved by the NHRA who holds the master lease. Kern County Airport owns the land. Jack rewrote his will so he could will the lease to us. He trusted us to run his operation. That was huge. Blake: My first exposure to racing was when I was two years old. I was at Lions drag strip hanging out at a souvenir stand. I remember helping out Marvin Miller at Famoso at age seven by selling programs. I went from picking up trash at the track to being a track operator. Call it on-the-job training. Racing jobs are the only jobs I've ever had. They are not like real jobs—I have way too much fun. Working at Famoso was an evolution for my dad and me. We found more and more ways to get involved. We cater to both the racer and fans. Without either one, we're out of business. We understand what they want and need. We want to make both parties happy. Bottom line is I'm still a drag racing fan first. I was raised as a fan. I've never raced. When ever I drive down to Pomona for a race or see one at Famoso, I feel like a little kid again. That's one reason I'm glad we got the rights to produce the March Meet from Goodguys last year. The March Meet is like hosting a giant party. You have to take care of all your guests. It'll be a lot of fun. 4. 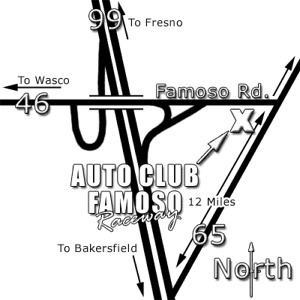 What's next for Auto Club Famoso? Didn't you just win The Most Improved Track Award? Blake: It was an honor to win the award. That's our motivation. We want to do a lot more for fans and racers at the track. We want to make it bigger and better, but not lose its nostalgic feel. We will continue to improve it. John: We have a five-year plan for Famoso. We already redid the track, concrete wall, etc. We want Famoso to be fan friendly and handle bigger crowds for better events. We want Famoso to be a big track with a small track feel. We can't lose sight of our heritage. Blake: 2008 will be the 50th year of racing at Famoso and we want to honor the past winners of the March Meet. Anybody's whose won or been in a race at the March Meet. It will be a major celebration all year long: 50 years of excellence. Tickets to the March Meet are available online, and will be available at the gate during the event. A three-day pass is $75. Tickets for Friday are $25; Saturday and Sunday are $30 each day. Auto Club members also receive a $2 discount off daily admission tickets by showing their cards when they purchase tickets at the track. Daily tickets for children ages 7 to 12 are $10 and kids 6 and under are free when accompanied by an adult with paid admission. racer who ever dreamed of competing. Reminder: Spring Forward: Daylight Savings Time goes into effect at 2 a.m., Sun., Mar. 11. The Kern County Racing Association (KCRA) operates historic Auto Club Famoso Raceway (just north of Bakersfield, Calif.) and promotes a full schedule of races year round, including the world famous March Meet. Now in its 49th year of racing, the March Meet, Mar. 9-11, 2007, is the recognized Mecca of Nostalgia Drag Racing. For more details, visit www.famosoraceway.com.